Delicious Campfire Cone S’mores. Image courtesy of PersonalCreations.com. Now that you’ve found your perfect fall campsite, it’s time to decide what you’re going to make. With so much potential for creative campsite meals, you don’t need to limit yourself to PB&J sandwiches and granola bars. The key to having a great campfire meal is all in the preparation. Doing most of the prep work at home before you hit the trails means you get to eat a great meal and have more time to relax around the fire at the end of the day. All of these recipes can be made with a few staple supplies: A lightweight pot and/or pan, aluminum foil, a spatula, a pair of cooking tongs and a portable grate to cover the fire pit. Don’t forget the matches and lighter fluid. Kebabs are (or should be) a camper’s best friend. There’s something very rustic and earthy about cooking your food on a stick over an open fire. And if it works for roasting marshmallows, why can’t it work for cooking your dinner too? 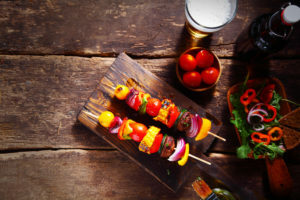 Skewer up your favorite veggies (like mushrooms, onions, and red peppers) and protein (shrimp, chicken, tofu), rub them with your favorite simple marinade (like mustard + olive oil, or BBQ sauce) and throw them on the grate over your fire pit. Just remember to cut all the food into bite-sized pieces ahead of time – you want to be able to eat your food straight off the stick, no cumbersome utensils involved! If you want to be really gourmet, you can also add some cubed cheese to the skewers after they cook. To assemble: Make a bowl out of aluminum foil, and add a handful of ground beef (or refried or black beans, for vegetarians), onions, peppers, and tomatoes. Seal up the aluminum foil into a package and toss it in the fire pit to cook, no grate needed. So easy! After 15-20 minutes, remove the foil package from the fire pit (be careful – the foil will be hot!) and add the contents to a tortilla for a hearty meal of campfire tacos. You can also scoop into the mixture with tortilla chips, or just eat it out of your foil bowl, burrito bowl style. 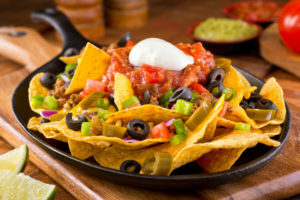 Once the nachos are assembled, cover the top of the pan with aluminum foil and place it on your campfire grate and let the nachos cook over the fire for around 15 minutes, or until the cheese has melted and the veggies have softened. Let the nachos (and pan) cool for a few minutes after pulling them off the fire. To finish, top with salsa and dig in! Don’t forget breakfast, the most important meal in life. And when making this recipe, advance preparation is key. Cooking your omelets in plastic freezer bags is a smart, time-efficient (and delicious) way to get a hearty breakfast on the table pronto — which is just what you need before a long day of hiking and exploring. This plastic bag method not only saves prep time, but it cuts down on cooking time as well, because you can boil all of the bags at once rather than making one omelet at a time in your frying pan. Forget plates and bowls and eat your eggs and bacon inside a potato, instead. A self-contained breakfast potato pocket is delicious and it reduces cleanup time. Heads up: You’ll want to bake or boil the potato ahead of time to make this as easy as possible. 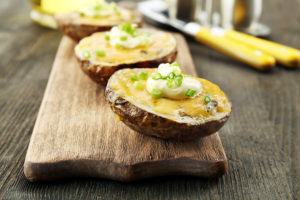 The recipe calls for you to bake the potato in an oven once you’ve assembled everything, but you can also wrap your potato pocket in aluminum foil and cook them on a grate on top of the fire pit. Once the egg is cooked to your liking, you’re good to go. Did you really think we’d forget dessert? 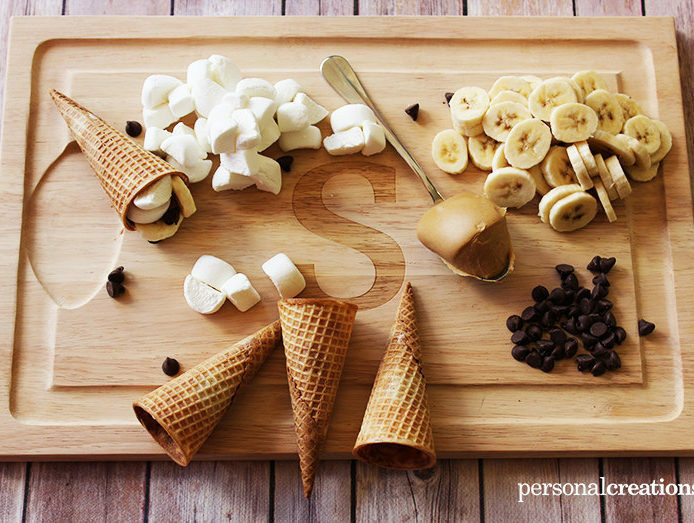 Making s’mores inside a sugar cone keeps the mess to a minimum and ensures that you get the perfect ratio of chocolate to marshmallow-to-cone in every bite. Pro tip: experiment with different chocolate bar flavors (like chocolate caramel bars! Or mint chocolate! Or chocolate peanut butter cups!) in place of the chocolate chips.